1. Atheism & Religionism versus The Gospel: What good can religion, agnosticism, or even atheism bring to a person? 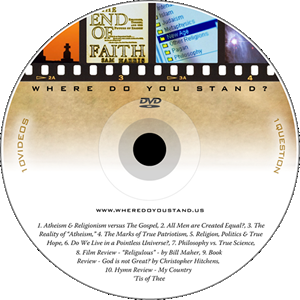 This video presents an important query about all three belief systems. 2. All Men are Created Equal? : Can it really be said that "all men are created equal?" Were men "created" and in what sense does the notion of "race" factor into this question? As well, is "racialism" a valid concept of the human race? 3. The Reality of "Atheism": Atheism is one of the fastest growing movements in America. What is Atheism, and how is it that atheists can come to such a conviction that there is no God? As well, why are the advocates of atheism becoming more active in advancing their viewpoints? 4. The Marks of True Patriotism: Do you consider yourself to be a good American patriot? What does it mean to be a patriot, and how might one live out such patriotism? As well, does your sense of patriotism change at all based upon who is serving in leadership at the time? 5. Religion, Politics & True Hope: Perhaps you have seen examples where religious faith has been used for the sake of political advantage. Is there anything wrong with using spiritual terms to describe our American politics & patriotism? 6. Do We Live in a Pointless Universe? : As scientists continue to research the vastness of space, we are discovering that the universe is much larger than we have ever imagined. Because of these ongoing findings within cosmology, many have surmised that mankind is utterly insignificant. As well, if it is true that the Universe will continue to expand forever into a cold and lifeless void, can it be said that "We live in a Pointless Universe?" 7. Philosophy vs. True Science: Can it be argued that the Universe "created itself out of nothing" as posited by Mr. Stephen Hawking? Is such a supposition the product of philosophy or empirical science - and does it matter? Will C.E.R.N. 's Large Hadron Particle Accelerator be able to unlock the universe's deepest secrets? 8. Film Review - "Religulous" - by Bill Maher: Bill Maher's movie "Religulous" argues that religion is harmful to humanity, and that all forms of theism amount to a single genre of foolishness called "religion." In this review we examine the best and worst of what Maher has to say. 9. Book Review - God is not Great? : Christopher Hitchens' book - "god is not Great" has become very popular throughout the world. He, like Bill Maher, argues that theism is "child abuse" and is a "poisonous branch that should have been snapped off long ago..." p. 275. Is religion a dangerous and poisonous branch within mankind? 10. Hymn Review - My Country 'Tis of Thee: The hymn "America" supplies some very important lessons about the nature of our nation's independence, dependence, and liberty. What is that message, and why is it still so important for our own day and age?